This talking metronome counts “one-two-three-four” repeatedly at a steady tempo. It can be used for music that is in time signatures of 4/4, 4/8, 12/8 (when it is a compound meter), or any other time signature that has four beats per measure. 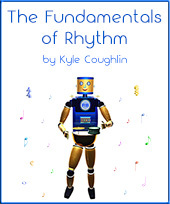 The talking MetronomeBots provide a great introduction on how to use a metronome. Students who have difficulty hearing the beat often find the talking metronomes much easier to work with than the standard clicking metronomes. Read the page on practice tips for more suggestions on how to practice with a metronome. A talking metronome in four that doesn’t require Flash Player is now available at my new site, MusicAllTheTime.com. These Youtube audio files can be played on any device, including iPhones and tablets. See my blog about MetronomeBot and Adobe Flash for more information. This metronome requires Flash Player. If you do not see the metronome or if it does not function properly, visit the new talking MetronomeBot in four, or select a tempo below. Get the Boss talking Dr. Beat DB-90 Metronome metronome.